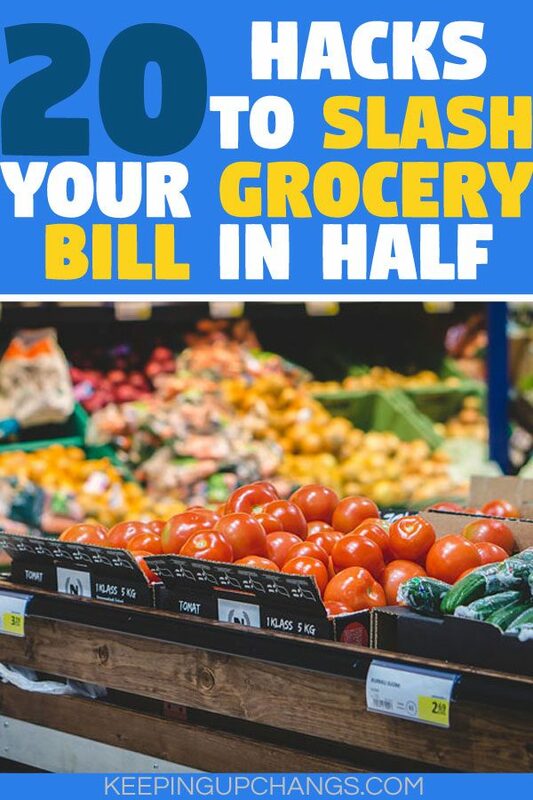 Save Money on Groceries: 20+ Ways to Slash Your Bill IN HALF! It’s not just teenagers that can eat you out of house and home. Your grocery bill is one of your biggest expenses that you can’t avoid. You can, however, slice it in half with these smart tips to save money on groceries. What is the best way to save on groceries? Following the tips that will actually turn into habits. You gotta eat everyday, so the grocery shopping thing is not going away. And because this isn’t a one-time task, aiming to build money-saving habits are what will bring you a real (and recurring) benefit. So take what you will from the massive list below and start saving on your groceries! Wasted food means money down the drain, so always take the time to double check what you have in the pantry, fridge, and freezer before heading out. Try to plan meals around what you already have at home, so that you can spend less at the store. This simply means deciding beforehand what you’ll eat each day. From that plan, you can then create a shopping list that you should stick to when you hit the store. Making a meal plan helps you save money because you won’t end up with unused groceries, plus you can make a point to incorporate cheaper ingredients or what’s on sale. Check your newspaper or other ads to price shop & see what items are on sale. If you see a great deal, incorporate those items into your meals for the week or stock up if it’s a non-perishable item. We get all of our non-perishable staples from Costco and Sam’s Clubs, which equals huge savings on ingredients we regularly use. If you don’t think you can use that much, consider splitting the purchase with friends or family so everyone can get in on the great pricing. To say that Amazon is a huge retail powerhouse is an understatement. What started off as a bookstore now carries virtually everything, including groceries! The prices are incredibly competitive or just downright cheaper, and you get the items delivered right to your door! If you are buying staples, you can choose to subscribe and get an extra discount. The items that have the most cost-savings on Amazon? Specialty ingredients like allergen-free stuff (gluten-free is a good buy). If you’re in the market for those items, do not skip out on checking Amazon because the savings can be huge. Our favorite place to shop is actually Chinatown, but not just because we’re Chinese. Your dollar often goes waaay further than in American stores because ethnic markets typically don’t spend as much on marketing and ambiance. We usually get 2-3 times as much food as we get at our local grocery store, which is why we shop here first. 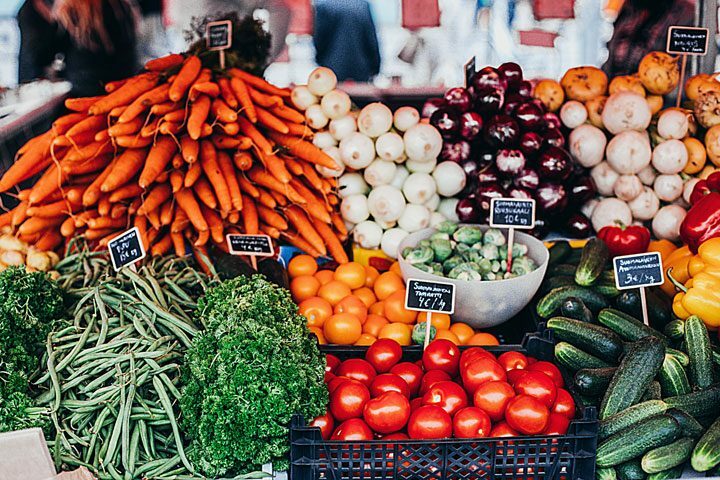 In terms of selection, you can find all the same produce, many of the same staples, and of course, a few ethnic specialties – all at much better prices. 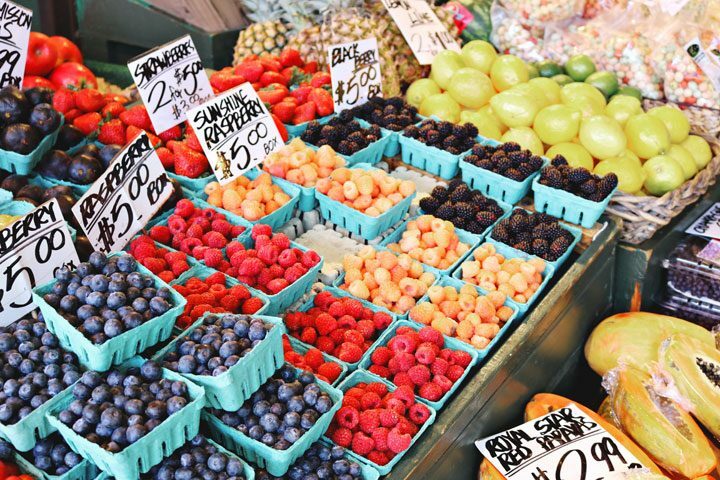 Farmers markets are another great place to get delicious, fresh produce at a good price. 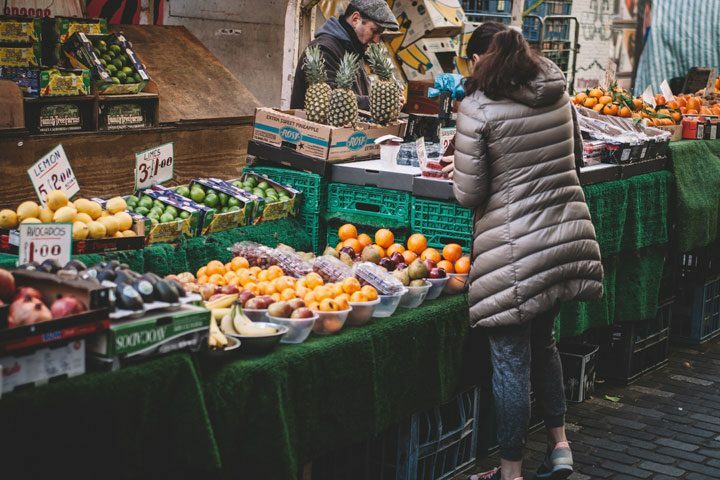 No-frills packaging, low overhead, word-of-mouth marketing, and selling directly to the customer means vendors can usually offer excellent prices for their goods. They’re also usually quite happy to answer questions about seasonality, recipes, and picking the best produce. Some food items are just way, way cheaper than others. A great way to slash your grocery bill cost is to set a super frugal option as your standard breakfast or lunch. For example, oatmeal is dirt-cheap. Aunty Chang usually gets a huge box at Amazon or a bulk store for less than $15, adds bananas and cinnamon, and feeds herself breakfast for the entire month for under $40. Lunch can be as simple as a PB&J sandwich, a rice bowl with black beans & salsa, or lentil soup. All of these meals can be made for easily under $2 a serving. Hundreds of insanely cheap meal ideas are literally at your fingertips. Google “cheap lunch ideas” or “cheap breakfast ideas” to find some that tickle your taste buds a little. In addition to taking out some of the guesswork from meal planning, it lessens your grocery bill too. Big-name brands spend tons of money on marketing and packaging. You don’t have to foot their bill for them, you know. Don’t be afraid to go with generic brand items, which are often significantly cheaper. The one exception: if you see that the brand-name version is on sale, double check both prices. Sometimes the store will price the name brand item low enough that it becomes the better deal. There are other common pitfalls that get in the way of you saving on grocery bill. Don’t make those mistakes or else you’ll pay, literally. 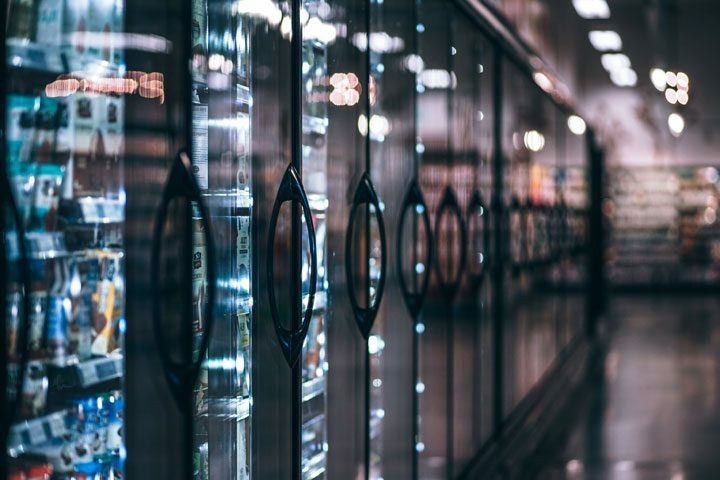 While it’s true that some retail stores are definitely more expensive than others, that’s not as certain when it comes to grocery stores. Their competition is even fiercer than on The Bachelor, so deals can be found where you least expect it. For example, Whole Foods is notorious for their highly-priced specialty items, but they were the cheapest place to get bananas and organic potatoes (both regular grocery items for us) in our hometown. For some things, they’re the same price as other stores but are of much higher quality so we also buy those items while we’re here. It used to be a tried and true rule that you’d be rewarded for buying bigger sizes with a lower per-ounce cost. Not anymore. Always do the math and double check because nowadays, the smaller size could be cheaper per ounce. Grocery stores are there to lookout for their own pocketbook, not yours. They simply want you to buy, and colored signs are a great way to get people to part with their money because they assume that it must be a deal. Don’t focus on colors, graphics, or terms meant to entice like “sale,” “special,” or “hot deal!”. Get in the habit of focusing on prices. Most tags have the price per ounce on the corner, which can help you judge which product gets you the real bang for your buck. With all the marketing gimmicks and endless array of selection, grocery stores are like a boot camp for your willpower. The more often you go, the more items and promotions you’ll see, making it MUCH harder for your temptation to keep it together. Also, going often is a sign that you are just winging it, without doing the planning steps we outlined above. Result? You regularly pay full price when you shouldn’t have to. You already use your phone to do everything, so why not use it to save money on your groceries too? The iBotta app shows you coupons & cashback offers valid at the stores you select like Target, Amazon, and more. It then lets you redeem them simply by scanning your receipt or when you shop online through the app. Click here to sign up and claim a $10 welcome bonus! Planting your own fruits, vegetables, and herbs lets you save money season after season. You can go as small as having a windowsill garden for things like fresh basil or dill. Pasta helpers – These are just pretty boxes with pasta, flavor packets, and a mark-up. Bottled salad dressing – Oil and vinegar based dressings are a synch to make, without you having to pay for the bottle or fancy label. Flavored water – An easy, healthy way to flavor your water is to just throw in some berries or slices of citrus. Trail mix – Make your own custom mix by visiting the bulk bin of your grocery store. Canned soups – Soups from scratch aren’t hard to make, can be customized to your liking, and aren’t loaded with as much sodium. Cooking spray – Just add equal parts water and olive oil into a misting spray bottle, then mix well to create your own cooking spray. Flavored cold/iced teas – Tea bags are a heck of a lot cheaper than bottled tea, so make big pots of regular tea and then refrigerate to create homemade iced tea. Flavor them with fresh berries or fruit slices. Learn how to save money on groceries so your cash makes it past the checkout line. Use our tips to save on your groceries to keep your food bill in check and your wallet a little rounder in the middle. Find the Right Budgeting Style for You!